Alaskan Malamute Characteristics: The Devoted and Frisky Alaskan Malamute is a breed of large dog classified as a member of the Working Dog Group (AKC:1935). 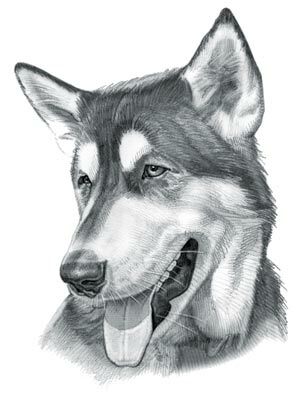 The Alaskan Malamute, is characterized by its powerful appearance with a broad head and a rhythmic, easy gait. Other characteristics include a broad, powerful back, large, almond shaped, brown eyes and triangular-shaped ears; rounded at the tips of the ears. The temperament of the Alaskan Malamute can be described as Loyal, Playful, Devoted. The coat type of the Alaskan Malamute is described as thick and dense coat in black, gray, red and white colors. Due to its characteristics and qualities, the Alaskan Malamute demonstrated the desired traits of a Watch dog and Hunting Dog and is known by its nick name the "Artic Dog". The origin of the Alaskan Malamute dog breed was in United States (Alaska) and was descended from the ancient dogs of antiquity. Alaskan Malamute Breed Group and Dog Type - Working Dog Group (AKC:1935): The Alaskan Malamute is one of the many breeds of dogs that belong to the Working Dog Group (AKC:1935). Other names for the Alaskan Malamute: The Alaskan Malamute is known by the nickname of the "Artic Dog". Other names for this breed of dog include the Mal, Mally, Maly and Malamute. Origin of the name: The origin of the name "Alaskan Husky" derives from its country of origin from Alaska in the United States of America. The word 'Malamute' derives from the name of the Native American Mahlemut tribes who homelands were located in the Norton Sound area of Alaska. Alaskan Malamute Origin: The country of origin of the Alaskan Malamute breed was in United States (Alaska) during the Ancient Times. The dogs used by the Mahlemut tribe were descended from the ancient dogs of early antiquity that date back thousands of years who crossed the Bering Straits from northern Europe and Asia to North America via the, then intact, Bering Land Bridge. The Mahlemut tribe used their dogs to act primarily as hunting dogs but were also used as watch dogs in their villages and to haul heavy loads on dog sleds. Alaskan Malamute History:The dog sleds were the only form of transport in the inhospitable Arctic region and the dogs became of great value to the prospectors who clamored to join the Klondike Gold Rush 1896–1899. Gold was discovered by George Carmack on August 16, 1896 in Rabbit Creek part of the Klondike River, which flowed through Alaska and the Yukon Territory. The gold prospectors paid enormous amounts of money for a team of Mahlemut or Malamute dogs to transport their supplies and equipment over the snow and icy terrain from supply towns such as Dawson City and Skagway to the gold fields. After the Klondike Gold Rush ended the Malumute was one of the Alaskan breeds used in competitive dog sled racing. The Alaskan Malamute was officially recognized by the American Kennel Club (AKC) in 1935. Alaskan Malamute Modern History: The modern history of the Alaskan Malamute moved on and the breed is still used to haul freight in remote Alaskan locations and on polar expeditions. Malumutes also continue to successfully participate take part in dogsled racing competitions. The Alaskan Malamute was named the official state dog of Alaska in 2010. Alaskan Malamute - Eight Below (2006 movie): In the 2006 movie 'Eight Below', starring Paul Walker and Bruce Greenwood, there are two Alaskan Malamutes (Buck and Shadow) and six Siberian Huskies (Max, Maya, Truman, Dewey, Shorty, and Old Jack). The movie was based on Antarctica and the dogs performed various stunts and pulled sleds. The 1961 Disney movie called 'Nikki, Wild Dog of the North' also featured the adventures of a brave Alaskan Malamute. Alaskan Malamute Height: This breed is classified as a large sized dog. The height to the shoulder of a male dog is 24 - 26 inches (61 - 66 cm). The height to the shoulder of a female dog is 22 - 24 inches (56 - 61 cm). Alaskan Malamute Weight: Not surprisingly for a large sized dog, the weight of a Alaskan Malamute male dog is 80 - 95 pounds (36 - 43 kg). The weight of the smaller female dog is 70 - 85 pounds (32 - 38 kg). Alaskan Malamute Coat Type: The double coat type is described as thick and dense outer coat (known as the guard coat) and undercoat. Alaskan Malamute Coat Colors: The colors of this dog breed include black, gray, red and white colors. N.B. The term "Red" refers to reddish shades of orange, brown, and tan colors. Alaskan Malamute Grooming - LOW Grooming Needs: The grooming requirements of the Alaskan Malamute is fairly minimal, one grooming session per week is generally enough to maintain a healthy coat, remove surface dirt, and reduce the risk of skin infections. Casual brushing and combing is all that's generally required. Alaskan Malamutes enjoy self grooming to keep themselves clean. Grooming Requirements should include bathing the dog on a monthly basis and making regular inspections of the nails, teeth, eyes and ears. Alaskan Malamute Litter Size: The litter size of this dog breed ranges from 4-10 puppies. Alaskan Malamute puppies for sale can be obtained reputable breeders and from rescue centers. The cost of Alaskan Malamute puppies varies depending on location, pedigree history and the dog breeder. Alaskan Malamute Temperament and personality: The temperament and personality of the popular Alaskan Malamute dog breed is described as Devoted , Loyal, Playful, Devoted and Frisky. Alaskan Malamute Exercise Requirements - HIGH Exercise Requirements: The exercise requirements of this breed of dog is high. The Alaskan Malamute requires regular daily exercise consisting of approximately one to two hours each day. This large, powerful dog has a smooth, rhythmic, easy gait with strides of a moderate length and requires a brisk walking speed or jogging by the owner to meet the dogs exercise requirements. Alaskan Malamute Diet: A fully grown Alaskan Malamute dog should be fed 2 times per day. A diet consisting of a premium dog food can be balanced with fresh food eaten by the family. The question is What Can Dogs Eat?. Check out our comprehensive list of what dogs can and what dogs cannot eat. Alaskan Malamute Health Problems: Potential health problems of the Alaskan Malamute breed include Hip Dysplasia, Gastric Torsion, Cataracts. Resolving health problems can prove to be expensive and it is always wise to obtain pet insurance or dog health insurance when buying a dog. Is the Alaskan Malamute dog breed said to be Hypoallergenic? Answer: No. Alaskan Malamute Lifespan: The life expectancy of dogs vary according to the size, breed of dog and any serious health problems. The typical lifespan of the Alaskan Malamute breed is 10-12 years. Alaskan Malamute Male Dog Names: Male Dog names are most often chosen to reflect favorite names of the owner or the strength, size, coloring and country of origin of the Alaskan Malamute breed. To give you some inspiration regarding good male Alaskan Malamute names our small selection might be of help with naming boy dogs. Our top male dog names are: Shadow *** Rusty *** Tempest *** Victor *** Dred *** Edge *** Buster *** Cody *** Jinx *** Payne. Alaskan Malamute Female Dog Names: Female Dog names tend to be softer, prettier and reflect the temperament of the Alaskan Malamute girl dog. Our top choice of good female Alaskan Malamute names are Misty *** Emma *** Vesta *** Cupid *** Kaige *** Lace *** Rain *** Sable *** Bella *** Cinder.